I'm a beginner, and one of my first tasks is going to be to get my bees out of a langstroth nuc and into my Warré hive. I've read several articles about how to do this, using both the chop method, a conversion box, and letting the bees grow from the nuc down into the Warré. This last method is the one I prefer, but I have some questions that I'm not entirely sure of. With the nuc on top like that, I also guess the hive is not going to be weatherproof, but I'm thinking I can set a little roof on top of the nuc. I'm decent at woodworking. Have I got the right idea here, or am I wandering from the straight and narrow? I have used the 'grow down' method to get a colony from a non-Warré into a Warré. It can take a while, though, potentially more than a season, so the joint needs to be weatherproof. Apart from that, you are on the right lines. I do not recommend the grow down method. It is the worst method to convert bees from one hive type to the other. I prefer most the chop method. It seems to be brutal but the bees do much better afterwards. As a beekeeper you sometimes have to behave like a bear. Another method would be a shook swarm or natural swarm. If you try the grow down method, you'll end up with a swarm in most cases anyway. You are an experienced beekeeper. Would you advise a complete beginner to chop, especially when it means cutting the top bars (which will be too long) as well as the sides and bottoms? I agree that grow down does not always work and that a swarm might be the result, but so what? That's what bees do, they swarm. True, a shook swarm will short circuit this, but what then to do with the brood and combs? In a disease controlling regime one might say destroy them (the bear again), but that is not what we are dealing with here. I'm interested in your further thoughts. If you shake or brush the bees off the comb and into a container, the comb is empty and can be worked and cutted quitely easily into shape and size. True, for a beginner this might be too much. But with a little help of another more experienced beekeeper this is the best method. For the bees! They soon recover and grow really strong. In a grow down setup the broodnest shrinks and the bees will attempt to swarm. You end up with a weakened colony going into winter. Bad start for the next year. Move the frame hive aside, so flying bees are out of the way. Pull frame, search for the queen, cage queen with a catching clip, brush off bees into a container. Walk away with the empty comb. It is a nice trick to walk through a bush or some brush, bees won't follow through green leaves and twigs. Cut off the side and bottom bars, cut the comb to size, a little triangular, cut the topbar to size, set into a Warré hive box. Repeat, until all combs are transfered. Set the Warré hive on the place of the old frame hive. Flying bees quickly return to the entrance and start fanning. Introduce the queen. Shake bees out of the container onto a board in front of the Warré, so they run up to the new entrance and into the new hive. The bees and beekeeper will be puzzled, but in a few days the hive starts growing strong again. The main task is brushing and shaking bees off the comb and walk aside to cut the frames to size. If you really want to do the growing thing, find and cage the queen, cage closed with fondant. Set a Warré box with foundation on top of the frame hive, a queen excluder in between. Bees soon will go up and cluster around the queen, drawing comb. Once there is brood in the Warré box and all brood in the frame hive has hatched, remove the frame hive. Why not just get a package so it's less messy and very easy to transfer? The bees will build their combs soon enough. That's what I did. I don't think it's actually possible to get packages in Nova Scotia, due to the small operators working here and the very restrictive prohibitions on importing bees. Everyone I've talked to only sells nucs. Also, I've also already arranged a deal which I would feel particularly bad breaking, although I believe the beekeeper would be okay with it. That said, I'm going to the Annual General Meeting of the Nova Scotia Beekeepers's Association tomorrow, so I'll be sure to find out more about the situation in the province. I get the idea that I will end up with nucs, however. As regards to the grow-down method, is there any way to prevent the likelihood of the broodnest shrinking and the swarm occuring? As to the chop method; I've read this is quite difficult without some attending help, but I've also got the tools and am confident in my ability to do it successfully with enough preparation and research. What I'm more concerned about is whether this will be bad for the bees themselves or not. I understand that swarming is a natural part of the bee life-cycle, but it would be disheartening nevertheless to have my bees swarm before I ever get a chance to "keep" them, so I would also like to pursue the most reliable method. If all you can get is a nuc, then I highly recommend you follow Bernhard's suggestion on the chop and crop. 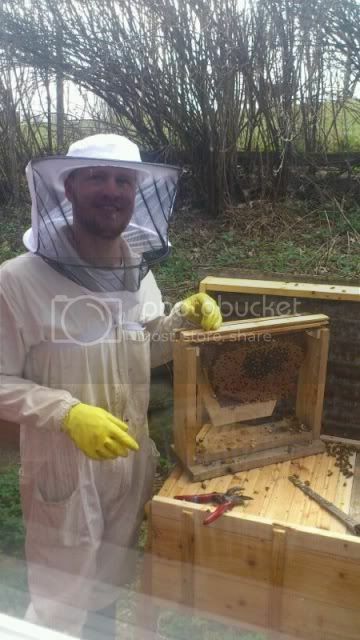 A year or two ago, another beek in this forum tried the grow down method into his Warre hive and it didn't work well for him either. In hind sight, he recommended doing the chop and crop. Can you talk the nuc supplier into catching the queen for you and putting her in a queen cage so when you do the chop and crop, you don't have to stress over finding the queen? When the bees are flying all over you, it's hard to concentrate on looking for that queen. I know, out of stress and excitement, I couldn't even tell the difference between the worker bees and the queen even when I'm looking at them through the queen cage screen. Just a thought. I learned it on my own, too. ...What I'm more concerned about is whether this will be bad for the bees themselves or not. This is the most reliable method I tried so far. And I did try all sorts of things. Better a shortterm shocking and recovering, as a longterm suffering. I tried to grow down a Lang into an hTBH once. They didn't go down and the colony swarmed itself to extinction. Luckily I managed to catch the prime swamp, that I put into a Warré hive, and caught a cast too that I homed in the TBH. If i had to do the same thing again, Bernhard's method of chop and crop is the way I would go and it will give you so much confidence. Good luck. you'll be fine and let us know how well you get on. Alright, at this point I'm leaning toward chop and crop. I've watched videos and read articles on it, and it seems very straight forward if I'm prepared. Bread knife and wire cutters for wax comb, tin snips for plastic. I've got those. I see people using bolt cutters to remove the bottom strip from the frame, but I assume that I would get a cleaner cut on the top bar by using a handsaw. Would using the saw be a problem? I'm picturing the back-and-forth motion being bad for the brood. Now, once I've got each frame Warré-ized, I simply place it, with proper spacing, into the Warré box, correct? Do I place the other top-bars along side of it? Is it better to leave them in a single box with the floor on bottom and the quilt on top, or should I put all the boxes together at once with them in the top? Sorry for all the questions, and thank you for all the answers. Cut the combs into a slightly angled shape. This makes the combs more sturdy. They don't break easily this way. Not so important with brood combs but with heavy honey combs. Put the box with transfered combs (and topbars alongside) onto an empty box with topbars and starter strips. PS: I use a handsaw. Thanks for those links, MObeek. I read through them thoroughly and learned quite a bit. 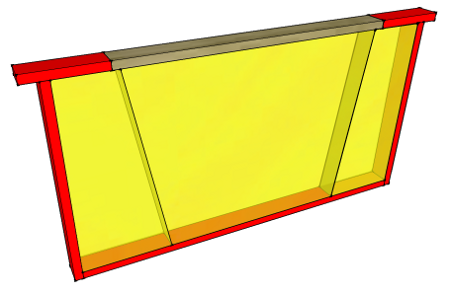 I didn't even think of the possibility that the langstroth bars may sit higher than the Warré recess allows for, so that's something else I can be prepared for. And Zaunreiter, those diagrams are excellent. Thank you very kindly. Is there anyone with experience putting shook swarms in TBHs or Warre hives? I was thinking that if you have a reasonably strong colony in any type of hive you may create a shook swarm while keeping the donor hive in tact. Of course if you migrate the queen to your new hive, the old hive will need to grow a new queen, but this way you leave brood in tact and rid the new colony from most mites. Is it likely that the shook swarm accepts the TBH or Warre hive as a new home? FWIW...My very first experience with handling bees was doing a chop and crop from a national nuc into a Warre box, on my own. More importantly though, the experience of dealing with an entire box of bees like that and going through each individual comb, one by one, is INVALUABLE experience for later on. Once you've done it, it makes the whole idea of going in again to check on them when you need to a lot less daunting when you're new to it. The grow down method will work if you provide them the means! Wax small pieces of spare comb between the middle top bars, set on top so that when it is put under the box above it will crush slightly between the combs. This is to act as a bridge which the bees will be able to cross from the comb above. Bees are reluctant to cross a divide and have been known to swarm through lack of space even though there was an empty box below! .My very first experience with handling bees was doing a chop and crop from a national nuc into a Warre box, on my own. This is also my experience, except yhat I trasfered my bees into a hTBH. First two times I had a person holding the frames while I was chop'n'cropping. The last time I used a DIY frame holder. Performing chop'n'crop by using a DIY frame holder. Note; I placed the follower board behind the frame for precisson cropping. I made my hive so the top bar of the frame fits the inside of the hive, just under the top bar. This holder is of no use if one has to chop as much as Bernhard suggested though. I've been thinking along the lines of providing a wax bridge too. I was thinking of just letting wax melt over the centre section of the two middle bars, so that it's coated right round the top and bottom. The only reason I see against this is that they will attach comb to the top of the bars and you'll have to cheese-wire the boxes apart. ...but they do that anyway! Well, from my limited experience, every box I've lifted had comb attached to the next set of top bars. Seems like even if it isn't 100%, the chances are so high that you should reasonably expect it to happen. So, you might as well provide a bridge, no? And little tools like that make all the difference too. This is amazing. Is it better than getting a package? Since you get comb with it? Can someone clarify for me what makes the grow down method so much more unlikely to succeed? In a standard framed hive the bees cross between the gaps into other boxes. The queen may actually lay across multiple boxes which means she crosses the divide. Even with the standard Warré method, the bees grow down from box to box and they have to cross a whole set of frames to do that. So if they grow down (or up) in a standard framed hive or in a standard Warré, why would they not do the same from a nuc to a Warré? I also see an additional problem with the Chop'n crop method, which is not just having to saw the extra length of the frames but also having to deal with the extra thickness of the frames. 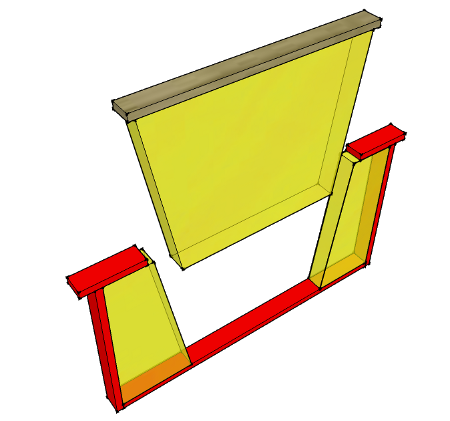 If I simply cut the extra length the frames will protrude from the top of the Warré box because they are thicker than the rebate of the box. Cutting a rebate on the frames while doing the chop'n crop makes the whole thing a lot more complicated. I am sorry if I am asking the obvious but I do not have experience with Warrés yet. Hoping to start next season. A nuc is not as strong as a full colony. The crossing of topbars or boxes is a matter of strength (and flow) only. A nuc usually is too weak to grow out of the nuc box. The problem is, that a nuc cannot get strong if left in the nuc. It'lll rather swarm as a small colony. So the best is to shortcut and get them out of the nuc box as soon as possible. For the topbar problem: cut the topbars to the inner diameter of the Warré box and use a nail at the right height at each side of the topbar to let the topbar rest in the rebate. There may be other, probably easier solutions. Thanks for the prompt explanation Bernard. The tip on the nails is valuable indeed. I had not thought of it. An additional question though. If a Warré box has 18.9 liters of volume and the bees are expected to grow down (although I have seen on other threads that they often don't) and a Langstroth nuc has roughly 22 liters, I would expect a colony in a nuc to be stronger than one in a Warré and move down more readily. So the question remains, why is a colony in a Warré expected to move down to the next box, but one in a nuc is supposed to be more reluctant when in fact the volume of a Warré is smaller than that of a Lang nuc? Thanks again for the previous reply. The Honeybees are thermophilic and love a space that is small and warm. One way to make a small family in a nuc go down into a nadiring box of normal size, is to reduce the cold space below. The smaller the the hive, the faster they work, if nadiring boxes below are too big, they may lose their spirit and only build a little or swarm, but when you bit by bit, give them more space below, they work with diligence, as long the weather allows. How about just waiting til next spring when there is less brood and shaking them out into the warré? Hi friends, I am in my second year of beekeeping - started with 1 lang, added 2 Warrés this year that my dad and I built. In hindsight I probably should have tried packages for the Warré hives but when I stumbled upon this thread I already had nonrefundable Nuc orders in. So, here's how things went with installation this spring. Hive A (lang) - popped the nuc frames in, hive went gangbusters, first deep is already full all 10 frames are drawn out and I just started them a second deep last week. Very strong colony. They are on plasticell at the moment (barf) but that's all I had.... next project with that colony is to start introducing foundationless frames which I am very much in favor of. Hive B (Warré #1/farm Warré) is located about 4 feet away from Hive A. Both of these hives are on my parents' farm. This hive is the one we attempted a chop-and-crop on. I watched videos, scoured forums, read a bunch, and even practiced cutting some plasticell before hand to be sure I had the right tools. I thought I was prepared but let me tell you... it did NOT go as planned. The nuc box was cardboard with wooden frames holding plasticell foundation, which I didn't realize until I opened it and started the chop-and-crop process. We smoked the box, brushed all the bees off each frame gently, then started to cut using a template we had made based on advice here. Once we started cutting, we immediately realized this was not going to go well. Cutting the plastic caused it to crack chip and splinter with every snip, and the plastic foundation would not stay in the groove of the top bar after the sides were removed. We tried to rubber band them to hold them on but it was an absolute mess. For the remaining frames we left one side intact then cut the other side in further to maintain stability, which worked, but was still very difficult. It was stomach turning to cut through the brood... literally nauseating, and I have a tough farm girl stomach haha. It was also physically very hard and messy to cut through foundation, frame, wax, brood, and honey even with two people. I could stand behind the idea of sacrifice/brutal installation method for long term stability of the colony, but this was just awful. If this was my first experience installing a nuc I might have walked away from out altogether, it was that stressful of an experience. The only way I would ever consider this method again would be if the frames were foundationless and the comb was easy to cut, as with a bread knife. This colony swarmed within 3 days. I caught it, rehived it, and it limped along for a couple weeks while its neighbor colony thrived. When I next checked on it 5 days later it had swarmed again, and the comb was being robbed by Hive A's booming colony. Not surprised, really, if I was traumatized like that I'd say "screw you" and buzz off too haha. When reading the advice some have posted it reads as "just do this-this-this easy-peasy" but my recent experience highlights that this is not always the case, which is why I thought I would share my experience. So... that brings us to Hive C (home Warré/Warré #2), which is at my house in the city. I set this hive up immediately following that wretched chop-and-crop experience, which I was not about to repeat, and decided to attempt the grow-down method. I bought a transfer box (cringe, I usually build all my own equipment but just didn't have time) and installed the nuc as soon as it arrived, so the cardboard nuc had been sitting on top of the bottom board at the new hive location for about 1 week when I installed them. They seem to be doing great, with no signs of preparing to swarm other than one tiny queen cell that I scraped off right away. They have good brood pattern and there is lots of hive traffic. The hive body below them has been in place for 2 weeks but they have yet to start building on the top bars. I see that many have observed that it can take a long time for the grow-down method to work if it works at all, but I think it's strange that bees are physically in the box, on the top bars, but there is no comb being built on them. Thoughts on this? I did add some wax comb bridges today to see if that would help increase traffic down into the new space but I would certainly appreciate any input. Thanks for your thoughts and advice and for reading this very long post. i am faced with this dilemma too. Making a sealable adapter easily for a poly Nuc is more than a little difficult. Having just done a shook swarm into a national hive and finding it pretty easy and having a poly Nuc with 5 frames of bees, I was thinking cutting most of the brood foundation out of the centre three and attaching it to three Warre bars with chicken wire stapled underneath and then shaking the bees in. Then feeding them whatever stores I can easily recover from the other frames until the foragers get going again. Later the stapled bars will be shifted outwards and eventually removed. Does that sound like a plan?